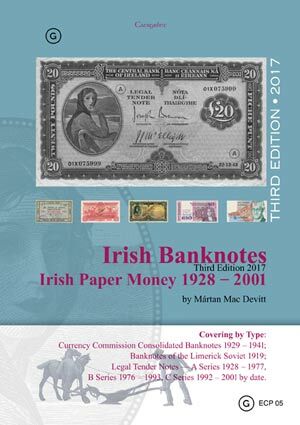 The Third Edition of "Irish Banknotes, Irish Paper Money 1928–2001" will be published in January. I have been promising this to many people for about a year now, so I suppose it is about time that I got it done! Briefly, there will be quite a lot of new content—I had to throw out some illustrations to free up a few pages for an article on the Ploughman notes! • Revised valuations throughout, based on market movements. A brief review of the state of the market in Irish note collecting, and of interesting items that have turned up—much of this is already on this site, posted as it occurred. • Progress report on the Ploughman Scan Survey, PSS, with a recalculation of the estimated number of surviving notes based on recorded notes. • Progress report on the Lavery Rare Notes Census, LRNC. • A major re-write of the section on Limerick Soviet Notes which reflects on, and analyses the new discoveries over the past two years. • C Series notes are covered by date in this edition, with updated prefix information which completes the prefix listings that we didn't know about last time round. The C Series information is now essentially complete. Updates to the replacement note prefix ranges are also made, though there is not a huge difference there. The book will be available from this web site, ebay, mail order, some dealers, and possibly Amazon if it is worth the trouble. Will it be for sale in the US? Yes, worldwide from this website, and from ebay. You are my hero, Mac ! I was at the printer's today, running a proof. Should be running the job tomorrow That means that they will be in bales in the corner before Xmas! The book is now available for sale on the web site, and on my ebay listing. Some of the dealers will get stocks of it also. Got my copy today, thanx. The info on the Ploughman notes survey is very useful. Maybe you will do a book on private banks someday too Is there a book on the private banks at all? PMI has a section on Private Banks, and Irish Numismatics magazine had articles on them. Other than that, there isn't much that I know of. Grades used are: VG, F, VF, EF, UNC. Scarcer notes are also valued in Poor grade.